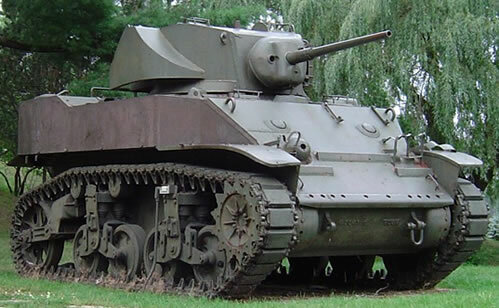 The M3/M5 Stuart Light Tanks were developed from the M2 series of Light Tanks and Combat Cars. In 1939 the US Army had 4 very similar AFVs in service. The infantry had the M2A2 and the M2A3 Light tanks, whilst the U.S. Cavalry had the M1 and M2 Combat Cars. The light tanks had twin turrets, one mounting a .50 heavy machine gun and the other mounting a .30 machine gun. The Combat Cars had a single turret mounting both machine guns. The last in the series was the M2A4 which mounted a 37mm gun in the turret with 5 machine guns (1 mounted coaxially and the remaining 4 mounted in the hull). 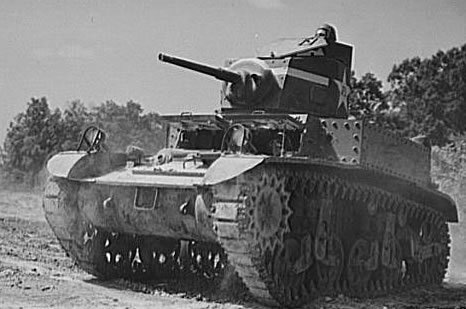 The M2A4 was, in fact, the prototype for the M3 Light Tank. The M3 included many of the features of the M2A4, but had increased armour protection from 10mm to 51mm. Other changes included removing the vision slits from the sides of the turret and a strengthened rear engine deck. With the increase in armour protection, the weight also increased, so the suspension had to be strengthened. The strengthened suspension employed a trailing idler wheel; this increased the contact between the tracks and the ground, thus improving the weight distribution. Standardised in July 1940, the M3 was manufactured at the American Car & Foundry Company, and during the next 2 years 5,811 were built. During these 2 years, various improvements were made. The turret was changed from a 7 sided, riveted shape, to a rounded shape. The welded turret gave the crew better protection because it removed the rivets which became deadly missiles, ricocheting around inside the turret if it was hit. The 2 sponson mounted machine guns were also removed, powered traverse was added and a gyrostabiliser was added, to steady the main gun while the tank was on the move. The gyrostabiliser proved to be unreliable however and was rarely used. Later improvements included a diesel engine and an all welded hull. The various improvements lead to a weight increase from 14 tons to 16 tons. The reason the engine was changed to a diesel engine was that the petrol engine, a Continental Radial engine, was needed for the aircraft industry. Only a few were powered with the diesel engines before Cadillac were asked to produce a prototype Light Tank powered by a V8 petrol engine. This engine was found to be far superior to any other engine, including the radial engines. It was far quieter and smoother running and, more importantly, was available in large numbers. By installing the new engine, Cadillac had to make so many changes to the hull of the M3 that a new designation had to be given to it. Originally it was to be renamed as the M4, but this would have caused confusion with the M4 Medium Tank (The Sherman). A new designation was therefore given to the tank; M5. The major difference between the M3 and the M5 was in the larger, boxier hull. The same suspension and turret were used; with the same armament of a 37mm main gun and 2 .30 machine guns; one mounted coaxially, the other on top of the turret as an anti-aircraft weapon. 8,884 M5s were built in total, including 1,431 which were sent to the British for service in North West Europe. The M3/M5 Stuart Light Tanks were named the Stuart by the British, but were almost universally known as the ‘Honey’. They saw combat with the British in the western desert and by the Allies in Europe. Although they were light tanks designed for reconnaissance, they were occasionally pressed into service as battle tanks when there was a shortage of better tanks. On one famous occasion, during the siege of Tobruk, some M3s were used to bluff the Germans into thinking that a larger formation of tanks was present in the area.